Earlier this week, the Chicago Board Options Exchange (CBOE) delisted Bitcoin futures. 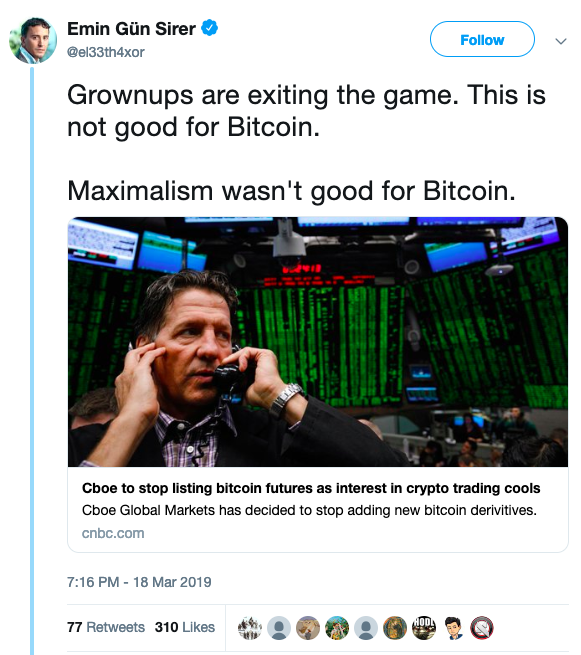 It’s not because institutional enthusiasm for Bitcoin has waned. In fact, CBOE lost badly to its archrival, the Chicago Mercantile Exchange (CME), in the regulated bitcoin futures market. 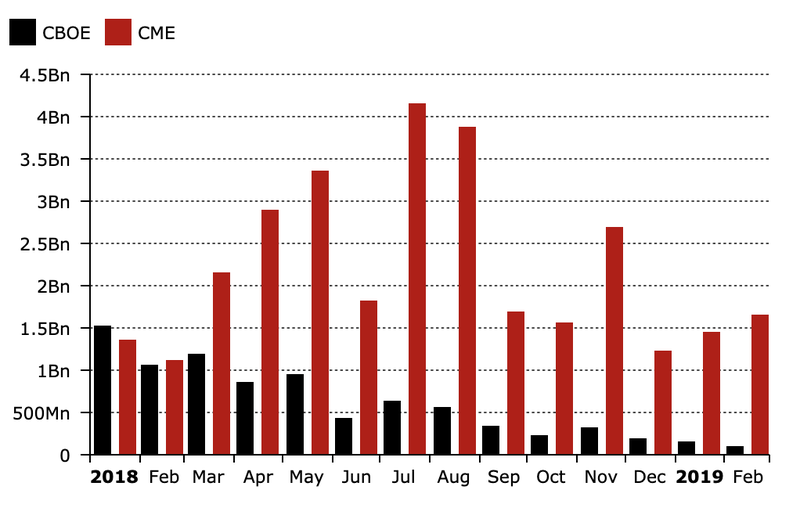 This is not the first time CME crushed the CBOE in trading volume. Historically, CME dominates CBOE in almost every market. The only product CBOE can (arguably) be proud of is the VIX, which is a measure of stock market volatility. The primary reason CBOE is good at that is they were the ones who pioneered the measure. Why did CBOE lose to CME once again, after they got off to an early lead? CME was already in a winning position before the battle even begun. They had more customers connected to their trading infrastructure, and it’s relatively easy for existing customers to start trading a new instrument when it goes live. This is the same reason Google will outcompete smaller firms on a new product offering thanks to its larger distribution channel. CME has a faster trading infrastructure. Other things equal, market-makers will always trade on the faster exchange, as they receive new information faster. In trading, speed makes or breaks your success. CBOE used the Gemini auction price as the settlement price, an extremely poor decision for which they have no one to blame but themselves. 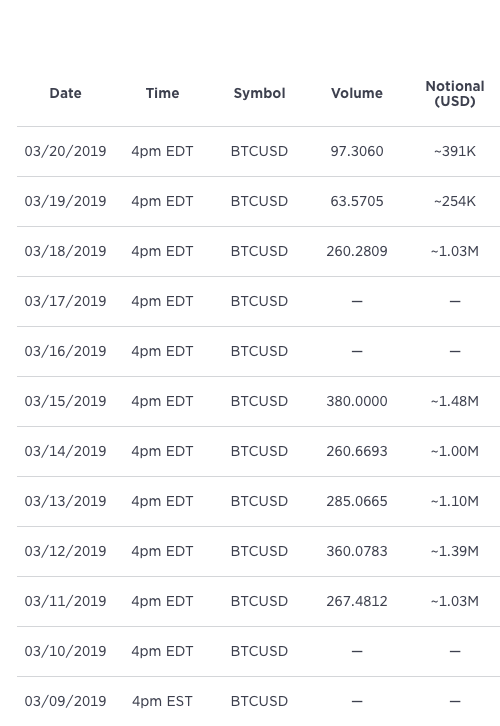 Gemini’s auction has daily volume of about $1,000,000, which is extremely illiquid compared to the futures market itself. No rational exchanges would ever, ever use an illiquid index to settle futures, because those become too easy to manipulate. No one wants to trade a derivative with even a potentially manipulated underlying instrument. Bitcoin isn’t dead. CBOE rightfully mucked a losing hand. There’s a more general lesson here about crypto exchanges to keep in mind. So why hasn’t Binance, as dominant as it has been, eaten the entire crypto market yet? For starters, exchanges like Coinbase in the U.S. and bitflyer in Japan have built moats around the heavily-regulated business of fiat on-ramps and off-ramps. Binance is dominating the crypto-to-crypto world for now, but there is still a tremendous amount of crypto-to-fiat infrastructure that remains up for grabs.